AWEA's WINDPOWER conference included a great breakout session on federal wind policy. Kevin Lynch of Iberdrola moderated the panel of Ryan Wiser of the Lawrence Berkeley National Laboratory, Walter Short of the National Renewable Energy Laboratory, William Massey of Covington and Burling LLP (I'm not linking to the site because it's frozen my computer twice) (and former FERC commissioner) and Seth Dunn of GE Energy. 1st Base: Financing. Restore the flow of project financing. The PTC’s been renewed for several years and that will be good when the capital returns, but we have to get financing right before any other policies can be effective. 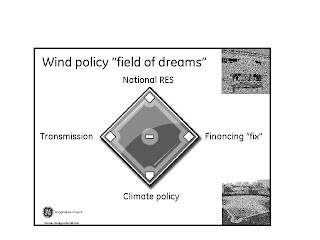 2nd Base: A national renewable energy standard (RES): 80% of wind manufacturing facilities that were expanded or announced in 2008 happened in a state with an RES. Now that the PTC is taken care of for a few years, the wind industry’s focus is on getting an RES. Dunn added than an RES shouldn’t weaken or get in the way of existing state regulations and should include bankable renewable energy credits (RECs) to reward companies who are ahead of the game (like GE). 3rd base: Transmission. Infrastructure is needed to support and move the power. Home plate: Climate policy. A price on carbon will send a signal to the markets that it’s time to invest in renewables. In 2009, the financing programs are up and running. A national RES, transmission and climate legislation passes. In 2010, financing programs begin a slow implementation. A national RES, transmission and climate legislation are delayed until 2010. When the panel was asked whether the wind industry would favor a carbon tax or a cap-and-trade policy, most agreed that the effect on wind would be effectively equivalent. Massey preferred a cap-and-trade policy because it lets the markets decide the price and, he believes, is the best long-term route to take. But the biggest detail is what the price of carbon will be. This distinction will drive the wind market, regardless of the specific policy implemented.